Sister Edith Bogue is offering the College's students a Benedictine view of life in her new "Ask a Sister About..." column in the student newspaper, the Cable. An associate professor of sociology, she answers students' questions in a voice that's at once serious and gently humorous. She's compassionate about students' concerns - which turn out to be quite universal - and uses plain vocabulary. There's a deep note of reassurance throughout. 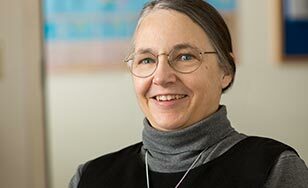 "After I've written it I go back and ask myself, what would somebody who doesn't know about Benedictines, or isn't Catholic, or isn't even Christian, need to know here," she said. "I want it to be accessible to a freshman who's unchurched, and who can learn something out of the faith of the Sisters who founded this college." She started the column because she wanted to see more Catholic identity in the Cable. "Sometimes the Holy Spirit just grabs you. It grabbed me and said, 'you do something about it.' "
Cable co-editor Thomas Gallegos said Bogue "has a wonderful way of explaining complicated questions in a calming yet informative way." Her first column was on prayer. Her second topic was, again, prayer - with tougher questions. Subsequent themes have included stewardship, religious names, beauty, "messing up," being home at Christmas, and perspective. She sees a common note of sorts emerging in her mini-essays. "A student asked me, 'what do you miss the most?' Lay people always think that living in a monastery means giving things up. Well, through these columns I've realized how happy I am. Day-to-day in my life, I'm aware of what's not working, but when I'm writing the columns I find I'm writing about what is working. When that student asked me, I thought for a really long time, and the only thing I could come up with finally was 'I miss Lebanese food.' " She smiled. "He looked dumbfounded." The column has also helped her see the beauty of her faith in clearer terms. "One of the ways we talk about God is as truth, goodness and beauty. I think of it as, truth is like the doctrine, goodness is like the morality, and beauty is like - beauty! I've thought about my faith in that way. Writing these columns has helped me put beauty more at the head of the list. The attractiveness of God. I'm so interested in Pope Francis in this sense. It's not like he changes doctrine or morality, but that he's putting God's love first, in trying to make God's love attractive to people. So that side of my faith has become stronger."